Video clip synopsis – The classic 1919 silent movie The Sentimental Bloke is regarded as one of the greatest Australian films. Broadband MP4 thesenti_bb.mp4 (17.4MB), suitable for iPods and computer downloads. The Sentimental Bloke is an episode of the series National Treasures produced in 2004. Students will develop knowledge, understanding and skills to critically and historically interpret art informed by their understanding of practice, the conceptual framework and the frames. 5.9	demonstrates how the frames provide different interpretations of art. The Sentimental Bloke (1919) is an Australian silent film based on the 1915 Australian book The Songs of a Sentimental Bloke by C.J. Dennis. “Ar rats!” 'e sez, an’ passes in 'is check. Quite natchril, Romeo gits wet as 'ell. “'Ush!” sez Doreen . . . “Shame!” sez some silly coot. The poems are written in the vernacular of the street gangs and working class of the day, and can be very difficult for students to understand without translations. The film was made by Raymond Longford and Lottie Lyell, at the time best-known partnership in Australian cinema, and was filmed mainly in the inner city Sydney suburb of Woolloomooloo. 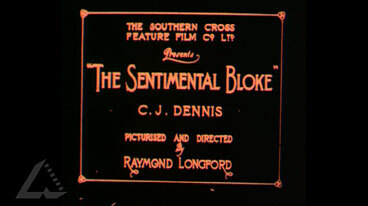 The Sentimental Bloke uses intertitles taken from the original poem written in Australian slang and was a hit when it opened in Melbourne, breaking all existing box office records. It was also popular in Britain and New Zealand, but did not succeed in the US, where test audiences failed to understand the language. The film was rediscovered in the 1950s and a new print screened at the Sydney Film Festival in 1955. Longford was found to be working as a night watchman on the Sydney wharfs. Since then the original negative sent to the US was discovered and found to be of a better quality print than any of the Australian copies. The new version premiered at the 2004 Sydney Film Festival and has played at the 2005 London Film Festival. Who is the Sentimental Bloke? What is the story that is presented in the film? What happened to the original film? Where was the film finally found? What had the Americans done to change it? How were people able to reconstruct the original film? Exploring issues raised in the video clip. use of black and white in the Hal Gye illustrations. The Sentimental Bloke was a popular book from its first publication. Is it likely still to appeal to its main audience today? Explain your reasons. Do a Google search for images of The Sentimental Bloke to see a variety of ways of representing the people and the period. Compare to contemporary photographs. Compare and discuss these. Why have different images for different media (film, play, ballet, etc)?